Lace Curtain Manufacturers, Broadway, NOTTINGHAM. LONDON OFFICES-110 Cheapside, E.C NEW YORK OFFICE-434-38 Broadway. NEW BASFORD, NOTTINGHAM OELSNITZ, SAXONY. BALTIC STREET, GLASGOW. CHESTER, PA., U.S.A. THE present season of 1898 will record few more noteworthy events in connection with the great Lace Curtain industry of Nottingham than the recently announced decision of its most prominent representatives, the old-established firm of Messrs. T. I. Birkin & Co., to offer the products of their Lace Curtain manufactories to the retail trade. This novel and enterprising departure from the accepted traditions of the firm has been influenced by the marked success which has attended a similar experiment in connection with their business in the United States, and by their appreciation of the tendency of modern commercial policy to bring the manufacturer and retailer into direct contact. This decision has, it may be stated, been arrived at in spite of the fact that Messrs. T. I. Birkin & Co. have for many years transacted a large and steadily increasing business with the principal wholesale houses at home and abroad, as evidenced by the fact that the returns for the past year have exceeded by a considerable sum those of any previous year. In an issue dedicated to descriptive reviews of the leading features of Nottingham's staple manufactures, it is most appropriate that there should be incorporated some particulars of the firm which was the first in the world to employ steam power in the manufacture of laces. The History of the Firm. The business was founded in 1825, by the late Mr. Richard Birkin, whose portrait appears on page 5 of the introductory portion of this work, and was carried on under his sole control until about the year 1850, when his two sons, Messrs. R. & T, I. Birkin, were admitted into partnership. The firm remained as thus constituted until the senior partner retired in 1856. The late Mr. Richard Birkin was for many years closely associated with the public life of both the borough and county of Nottingham, and was Alderman of the Borough, and four times Mayor, viz., in the years 1849, 1855, 1861 and 1862. At the close of his last term of office he was publicly presented with a magnificent piece of silver-plate by the Corporation, in recognition of the great services he had rendered to the town. He was a magistrate, both for the City and County, a Director of the Midland Railway Co., and fulfilled the office of juror for lace in the Great Exhibition of 1851, and also in those of 1855 and 1861. After the retirement in 1856 of the Founder, his sons jointly carried on the concern until 1862, in which year Mr. Richard Birkin, jun., in his turn retired, since when the present principal, Mr. T. I. Birkin, has remained at the head of affairs. The year 1869 is a memorable one in the firm's annals, for it was then that the manufacture of lace curtains was entered upon at the Basford Works. From its inception this enterprise has been one of continuous growth, it being to-day, including its branches in Saxony and the U. S. A., considerably the largest in the world in this section of the lace trade, and further extensions are in contemplation. 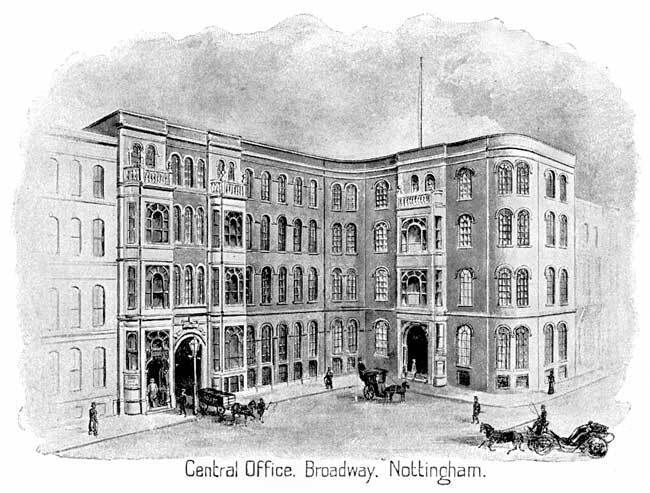 At the present time (1898) the business is divided into two sections under the separate styles of Birkin and Co., and T. I. Birkin and Co., both having their headquarters at Broadway, Nottingham, the former embracing the whole of the fancy lace manufactures, and the latter that of the lace curtains. Several of Mr. T. I. Birkin's sons are now associated with him as partners, taking individual supervision of the various departments. Mr. T. I. Birkin is a magistrate for the borough, and a magistrate and a Deputy Lieutenant for the county of Nottingham, of which he was High Sheriff in 1892. He is a director of the Great Northern Railway, and was British Juror for lace at the Paris Exhibition of 1878. With this brief resume of the more purely personal history of the firm, attention may next be directed to the several departments of manufacture, with an explanatory description of the buildings depicted in the series of illustrations accompanying this notice.